The Athletic guys both think Foles is gone, and quickly. Obviously Curry will be too. 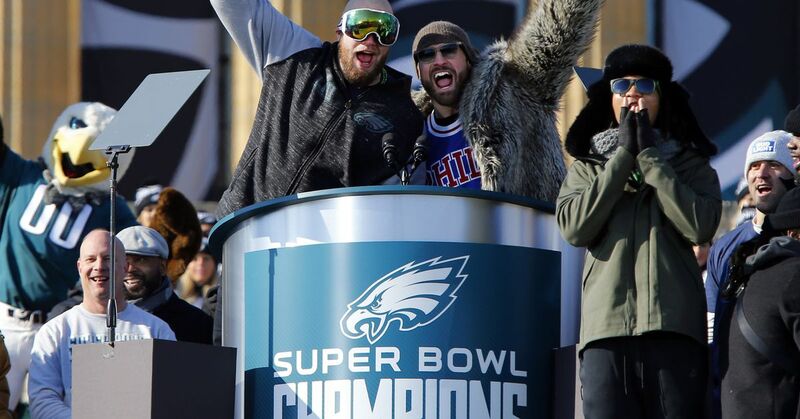 With the start of the new league year approaching, Sheil Kapadia and Bo Wulf make predictions on what will happen with 19 different Eagles players, including Nick Foles, Nigel Bradham and Vinny Curry. With the Bills trading Taylor to Cleveland that leaves at least 4 teams with playoff aspirations that don't have a starter on the roster. Two of them have nary any QB on their roster (ARI and MIN) and BUF has only Nathan "5 INT per half" Peterman. DEN with Paxton Lynch and Trevor Siemen. So Cousins fills one cavity, but if the next best options are Bradford and Bridgewater it would seem to me that Foles has to look like the best alternative to the remaining three clubs. Buffalo in particular -- they trade Taylor without any type of Plan B? Man that would be crucifixion city if they end up betting on Bradford's knees for 2018, arthritic as they must be by now. Guess we will find out this week. Isn't there some kind of rule about a team being below the cap before it can participate in the draft? They have to be below the cap before the start of the official season, which is this week. I have no idea what the penalty is if they don't get below cap by this date. This is also when a big payment to Foles is due, so if he is traded it will be now. I'm not so sure about Foles. The buyers have some leverage this week, and the Eagles may not be motivated to lower their price (much). Would you rather have cap trouble you have to solve in another way short-term, plus a 2nd and 3rd rounder, or less cap trouble and just a 2nd rounder? (Especially since that 3rd round pick would presumably replace a vet)? And what if nobody bites and then you have to trade him cheap because you were counting on the savings? I'm assuming the Eagles can't actually get what they reportedly want, a 1st and 4th, this week. Maybe later. Even much later, if there's an injury, but then they don't get 2018 picks. You make some other moves and then if you do trade Foles you'll be able to add back some cheaper FAs (as well as, perhaps, a back-up QB). I see the Eagles can only save $5.2 million of his $7.6 million hit, does waiting or not waiting for the bonus make any difference either way? Yes, as I understand it -- which may be wrong, once they've paid the bonus there is nowhere near $5.2 to be saved trading him later. I wouldn't bet on another Bradford-type opportunity. That was a combination of flukish injury timing and bad dealing by other GM. Because the bonus is guaranteed in the contract and payable 3 days after the start of the league year, as long as they trade Foles (vs releasing him), my understanding would be that it wouldn't make too much difference when he was traded. The $3M would be part of the "salary" traded. The real impact is relative to the Eagles complying with the cap as of March 15 -- if he is on their roster the money counts against the cap test -- if traded by then he is off the roster. Of course, if traded after the 15th +3, the Eagles would also be out the $3M in terms of actual cash flow too. I read through the CBA again and didn't see this being a requirement, although the team needs to have the money available within the cap to sign a rookie contract. the league front office validates the money being available when approving the contracts. there is a requirement that any drafted player must be tendered a contract at the stipulated amounts, but given the way draft choices are so often traded during the draft (and associated slot values) my impression is that it is a post-draft control. If I understand it correctly none of these trades are official until after the league year begins which means none of these trades save the Eagles cap space in time for that deadline. They need to be releasing/restructuring. With the legal tampering window open, reports are coming in of many free agent signings. Eagles are linked to signing DT Haloti Ngata. Trey Burton looks to be signing with the Bears, Beau Allen won't be staying, he will be signing elsewhere. Eagles have released Celek and signed DT Ngata from Detroit. Looks like TE Burton going to sign w/ the Bears. With Celek gone, I guess the longest tenured Philly athlete is Claude Giroux. Wow. But classic Eagles. Guess Celek didn't want to restructure. They're really making an exception (to the hard-line approach) with Jason Peters huh? At least, so far. I honestly don't want them to restructure Peters at this point, because, frankly, he should be given the same respectful treatment as Celek after this next season, if not before IMHO. The restructure of Johnson's contract concerns me. We know that Carson Wentz is going to cost a GREAT DEAL of money after this season, restructuring Johnson to add to future cap numbers doesnt seem like a great idea. I know it helps today, but it also reduces the flexibility as I doubt Johnson will keep doing this. Cox needs a restructure also, but I suspect that is after this next season. If we sign Robinson we really need to trade some CBs. We have gone from not having any NFL CBs to way, way too many of them. Weird problem, hopefully we can turn some into either draft picks or assets to move up. Eagles MUST trade their 1st round pick. It is valuable as anything in the first round has the advantage of allowing for a 5th year option, so teams will want it. We need more picks, trading it for say a 2nd and 4th is almost necessary. I doubt we can get anything for Vinny Curry with his onerous contract, he sadly is just a release at this point I suspect. I am sure Roseman is trying but he can't get a miracle every time, Torrey Smith's trade was a true miracle. With Bradford going to the Cards the destinations for Foles is dropping. Buffalo? Jets? I almost feel bad doing that to Foles. Reports earlier today is that Foles isn't being traded. 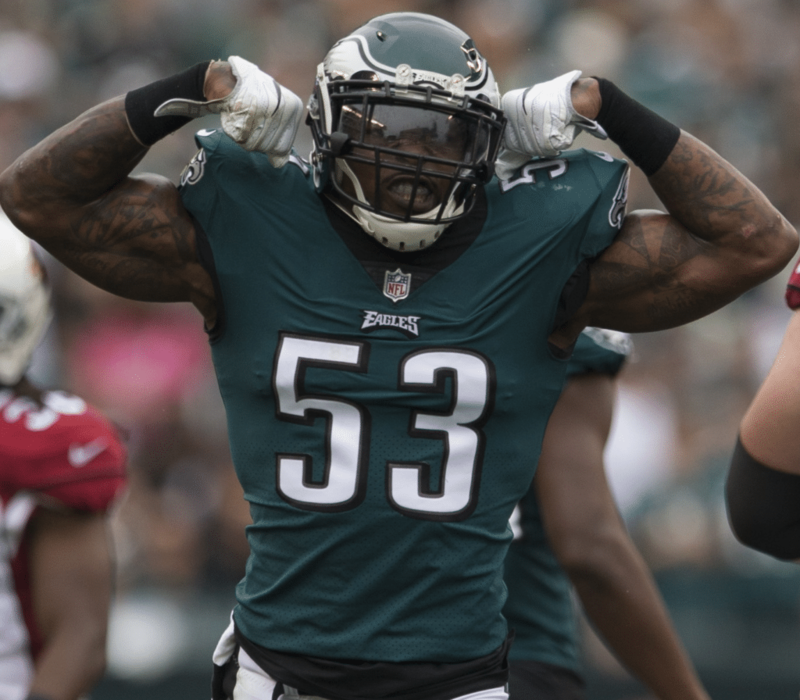 Eagles re-sign LB Nigel Bradham 5 Years/$40 Million (expecting to shop Mychal Kendricks with Korey Nelson as his replacement). Patrick Robinson signs with the Saints, Beau Allen signs with the Buccaneers. Honey Badger was released by the Cardinals, wondering if he would take a lower contract to play with the World Champs. Wow, that's a contract for Bradham. A couple sites I follow had him projected at 2@$6M, so while I was expecting somebody might add a third year at his age, getting 5@$8 -- wow. Will be interesting to see how much dead cap there is starting in 2020. No doubt I would rather have Bradham over Kendricks for the next two years if the cost is about the same. Think Kendrick's hit in 2019 was increasing to $8.6M. See the Bills decided to settle for McCarren and a trade up QB. God bless them; heck of a gamble with a playoff caliber team. Shady must be ecstatic.